This is not just any chocolate dipped biscotti, it is Chocolate Dipped Caramel Chocolate Chip Biscotti!! 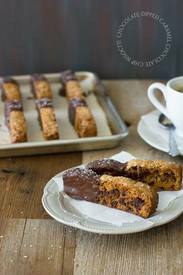 I had this idea a lonnnng time ago to make sort of a caramel mocha-inspired biscotti, but it never really became reality until I got a little treat in the mail that made me realize it was totally time for that to happen. The treat was a couple bags of Nestlé® Toll House®Delightfulls™ Filled Baking Morsels – aka chocolate chips stuffed with (in this case) a sweet caramel filling. And can I just say? GENIUS idea. Since the Nestlé Toll House Delightfulls take care of the chocolate AND caramel components of a caramel mocha, it was super-convenient to just chop them up and throw them into a brown sugar and espresso-powder infused dough to make my idea come to life. I literally couldn’t wait to try one after they came out of the oven despite the very obvious risk of burning myself (you’d think I’d learn but apparently not), and they were so crazy good that I was *this* close to skipping the whole chocolate-dipped component of the recipe. If you know me, you also know that I’d be the last person to skip dipping anything in chocolate, so that should tell you that even without it, these were pretty darn amazing.